Tanglewood’s Festival of Contemporary Music opened in a big way Monday night with five works performed by the Tanglewood Music Center Orchestra, four of them world premieres commissioned to celebrate the Center’s 75th birthday. The connection between new music and the repertory performed in most concerts during a Tanglewood season goes all the way back to the first year of the Music Center, 1940, when Serge Koussevitzky invited Aaron Copland to be its head. Koussevitzky was convinced that those who created music and those who performed it were always meant to be part of a unified circle of activity. Copland maintained his directorship for a quarter-century. When Charles Munch was BSO music director, he left the Center pretty much to itself. 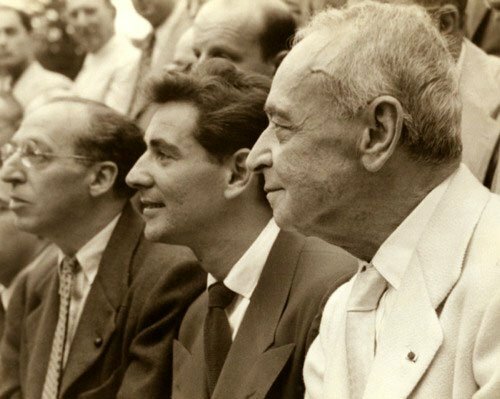 A proposal by philanthropist Paul Fromm to present more contemporary music at Tanglewood with support from the Fromm Music Foundation led to much more active representation of such music from the mid-1950s. Erich Leinsdorf’s arrival as music director, in 1962, brought with it a revivification of the Center particularly through the agency of Gunther Schuller, who was brought in to join Copland in the summer of 1963. The following year the Festival of Contemporary Music took place for the first time. Called the Festival of Contemporary American Music at first, within a few years it was broadened in scope to include European music and eventually music from all over the world. One of the marks of the Music Center over the years is that brilliant young musicians and composers who first arrived as students, or Fellows as they are called, have returned sometimes in positions of leadership. Composers who have made a signal contribution to Tanglewood in the years since the early 1980s include Oliver Knussen and John Harbison and more recently Michael Gandolfi. It quickly became standard practice for each instrumental and vocal Fellow at Tanglewood to take part in performance of contemporary music, occasionally during the weekly chamber music concerts but especially during the Festival of Contemporary Music. Most sessions of the Festival call for chamber works, both instrumental and vocal. It was common for one of these events to feature an orchestra of chamber size, and the final concert of the series to call for full orchestra. The 2015 Festival differs slightly in having opened with a full-orchestra concert last Monday, July 20; it will be closing with another next Monday, July 27. The remaining Festival concerts call for varying sizes of ensembles, some with vocalists, performing on Thursday evening (8pm), Friday afternoon (2:30pm),Saturday afternoon (2:30pm), Saturday early evening (6pm), and Sunday morning (10am). All performances take place in Ozawa Hall, where seating for these events is by general admission. The splendid opening concert, on Monday evening, consisted of works by five composers who had been composition fellows at Tanglewood between 1949 and 2009. Four are still alive and were happily able to respond to commissions for works to celebrate this 75th anniversary. The German Detlev Glanert, a 1986 Fellow, is not as well-known in America as he is in Europe, where he is a prolific opera composer, but his single-movement new piece, American Prelude No. 1, is short, bright, and festive with brass fanfares, and made a perfect concert opener while offering tribute to the country where Glanert enjoyed the advanced training that Tanglewood offers. As it turns out, he has been commissioned by three different American organizations for short orchestral works. He intends American Prelude No. 1 to be the first of a triptych, which will be performed complete next March. Conducting Fellow Ruth Reinhardt made a joyous, assertive work of this prelude. The oldest living composer to be represented with a new piece is the Finn Einojuhari Rautavaara, who was a Fellow in 1955 and 1956. His work grows out of the tradition of Sibelius, with a somewhat modernized language. His voluminous output, including nine operas and eight symphonies, is widely performed. Performed Monday night was an orchestral version of a piece he composed for violin and piano for Midori. The overall work is entitled Lost Landscapes, one movement of which reflects his memories of Tanglewood. It is a sustained piece for string orchestra with solo violin, in which the essence of the music is continuity, broad lyrical lines in both the soloist’s part and the orchestra’s. The solo part, beautifully played by Samantha Bennett, hardly requires the player to take bow off string. The string orchestra, too, plays smoothly and continuously, though often at a different speed from the soloist. At one point the concertmaster, Natsuki Kumagai, departs from the rest of the string orchestra and temporarily plays with the soloist. The coordination of these rolling, continuous waves of sound, in their diverse tempi, was finely directed by conducting Fellow Marzena Diakun. The youngest composer in the opening concert was Andreia Pinto-Correia, from Lisbon but now resident in New York, who studied at the New England Conservatory and was a compositional Fellow in 2009. Her new work was entitled Timaeus, after Plato’s late dialogue that gives an account of the world’s creation at the hands of a “craftsman god who imposes order on a pre-existing chaos,” to quote from her program note. Its orchestral layout into four groups representing the classical elements of earth, air, fire, and water was inspired by the work of Elliott Carter, whom she met when she was a Fellow and who often shaped ensembles into varied subgroups. These subdivisions interact throughout the three movements of the 20-minute work, which are entitled “The Work of Reason,” “The Work of Necessity,” and “The Work of Reason and Necessity.” Though all of this background suggests a complex pre-compositional shaping that demands some kind of philosophical stance and close attention to get, the actual effect of the music is of a richly detailed and varied pointillism, orchestral colors coming to the fore and being overwritten by still other colors, to result in a shimmering evocation—if one cares to listen in these terms—of a universe of moving atoms and molecules coming into organized existence. Guest conductor Christain Reif brought the elemental soup into its final alignment. The last of the premieres came from the pen of the Dutch composer Robert Zuidam, who was a Fellow at Tanglewood in 1989 and returned in 1990 as winner of the Koussevitzky composition prize; he has returned twice since then as a faculty member. For the 75th anniversary of the Music Center he composed a full-fledged piano concerto for Emanuel Ax, who had become a fan of his music at Tanglewood when one of Zuidam’s pieces was performed there in 2001. The new Tanglewood Concerto, consists of three movements, each of which evokes a particular Tanglewood scene (recalled with what must be considered Zuidam’s lively sense of humor) and each dedicated to a different person encountered in his Tanglewood experience. The orchestra is full-sized, and the piano part for Ax is often fast-moving and virtuosic, especially in the first movement and the short finale. Zuidam tells of an odd experience from his first summer that motivates the opening of the first movement, “Rehearsal at the West Barn,” dedicated “to Ollie Knussen.” In the composer’s words, “The opening chord … is derived from Fishbone, the very first of my compositions to sound at Tanglewood, which was during a rehearsal at the West Barn. After having struck this opening chord, the pianist of the ensemble, a red-haired Canadian fellow, rushed outside into the pouring rain and clamorous thunder. He had no intention to return. The rehearsal of the piece could only continue after a new, less daunted pianist had arrived.” On Monday night, the opening chord sent no one rushing out; it began instead the vigorous generation of lively, pounding, dancing interplay between Emanuel Ax and the orchestra, under the direction of Stefan Asbury. The remaining movements consisted of a landscape scene, “Moon over Lake Mahkeenac,” portraying the tranquil nocturnal view from Koussevitzky’s home, Seranak (where the composition Fellows lived at that time), and evoked extensive conversations with another composition Fellow that summer, Randy Woolf, dedicatee of the movement. The finale is brief and energetic, recalling stories of the “somewhat outlandish and avant garde driving style” of Lukas Foss, and Zuidam’s own experience in accepting a ride from Foss to the Hawthorne Cottage, where composition classes were held. The lively finale, which grows directly out of the previous nocturne, is, of course, dedicated to Foss. The final work, also conducted by Stefan Asbury, was one of the scores sometimes credited as an opening salvo in what was called the New Romanticism about 1980, Jacob Druckman’s Aureole. Druckman had the reputation, as expressed by many composers during his last decade (he died in 1996), of being one of the great masters of orchestral color of his time. That gift is very much on display in Aureole, written for Leonard Bernstein and the New York Philharmonic and based on the Kaddish theme from Bernstein’s Third Symphony. The tune is presented throughout as surrounded by radiant orchestral colors in a halo, or aureole, a gilt radiance of sound that employs every part of the large orchestra with the utmost imagination of heterophonic melodic lines and barely imagined hues. Ozawa Hall was substantially filled for this very satisfying program, in which the members of the Tanglewood Music Center Orchestra encountered five pieces they had never played before and presented the audience with an evening of most inspiriting accomplishment.